Discussion in 'iPhone and iPad Games' started by Techzamazing, Sep 17, 2016. If the world as you knew it was destroyed, how far would you go to get it back? The Cylons have returned to the Twelve Colonies after a forty-year absence. Bent on revenge, they unleash nuclear weapons powerful enough to destroy human civilization... and nearly succeed. The only survivors of the Cylon assault are a ragtag fleet of civilian ships and the last remaining Colonial Battlestar: Galactica. 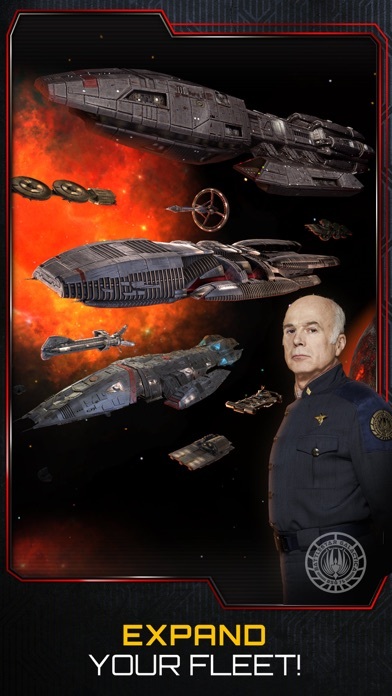 As Commander of Galactica, you must lead the civilian fleet through uncharted space in search of a new home, while defending it from relentless Cylon attacks. These machines never sleep; letting your guard down for even a moment will cause not only your downfall, but also that of the entire human race. - BATTLE waves of Cylons intent on your destruction. - CONSTRUCT a wide variety of Colonial combat ships from blueprints found on Galactica. 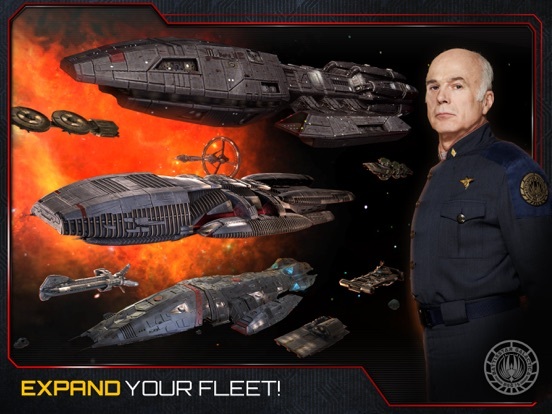 - TRANSFORM your ships into high-performance fighting machines with scavenged technology. - ESCAPE an overwhelming Cylon onslaught by executing a faster-than-light JUMP! - DEFEND the civilian population that depends on you for protection. - And above all, SURVIVE long enough to continue the search for planet Earth, humanity's new home. 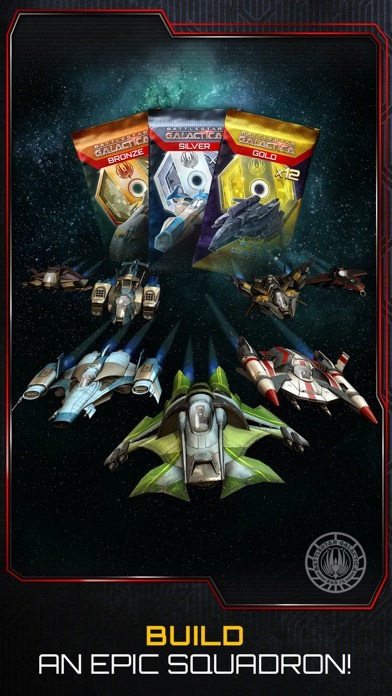 Battlestar Galactica: Squadrons, collects non-personal user data (including aggregated data) and connects with 3rd party social media applications. Please note, Battlestar Galactica: Squadrons is completely free to play but offers some game items for purchase with real money. If you choose not to use this feature, you can disable in-app purchases in your device's settings. ©2016. Battlestar Galactica and Battlestar Galactica: Squadrons and their respective logos are trademarks and copyrights of Universal Television. Licensed by Universal Studios Licensing LLC. All Rights Reserved. If the world as you knew it was destroyed, how far would you go to get it back? The Cylons have returned to the Twelve Colonies after a forty-year absence. Bent on revenge, they unleash nuclear weapons powerful enough to destroy human civilization... and nearly succeed. The only survivors of the Cylon assault are a ragtag fleet of civilian ships and the last remaining Colonial Battlestar: Galactica. 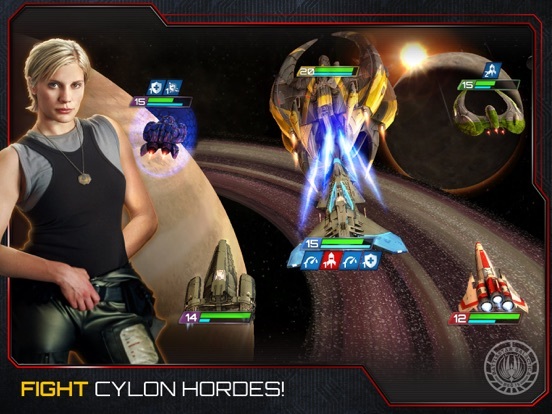 As Commander of Galactica, you must lead the civilian fleet through uncharted space in search of a new home, while defending it from relentless Cylon attacks. These machines never sleep; letting your guard down for even a moment will cause not only your downfall, but also that of the entire human race. 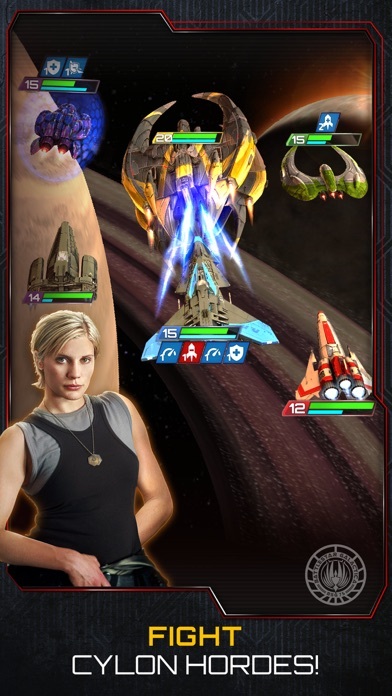 In Battlestar Galactica: Squadrons™, you will: - BATTLE waves of Cylons intent on your destruction. - CONSTRUCT a wide variety of Colonial combat ships from blueprints found on Galactica. - TRANSFORM your ships into high-performance fighting machines with scavenged technology. 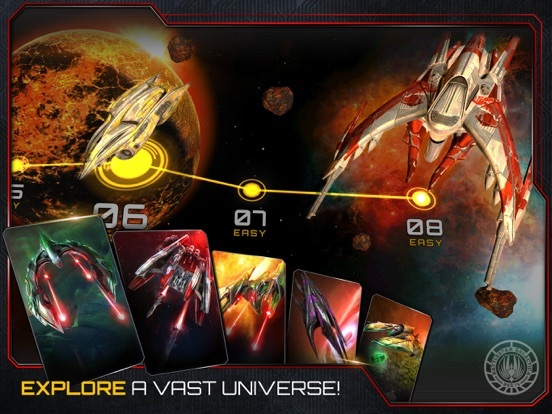 - ESCAPE an overwhelming Cylon onslaught by executing a faster-than-light JUMP! - DEFEND the civilian population that depends on you for protection. - And above all, SURVIVE long enough to continue the search for planet Earth, humanity's new home. 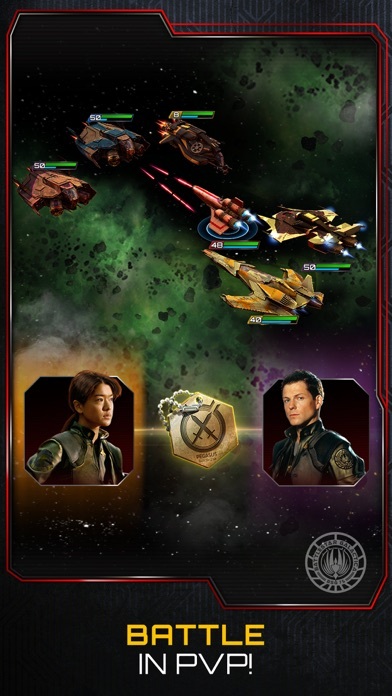 -- Battlestar Galactica: Squadrons™, collects non-personal user data (including aggregated data) and connects with 3rd party social media applications. 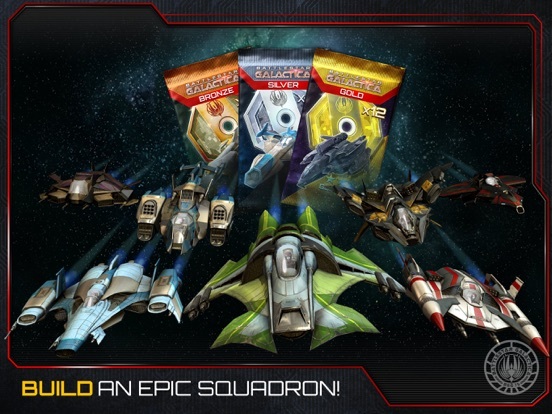 Please note, Battlestar Galactica: Squadrons™ is completely free to play but offers some game items for purchase with real money. If you choose not to use this feature, you can disable in-app purchases in your device's settings. 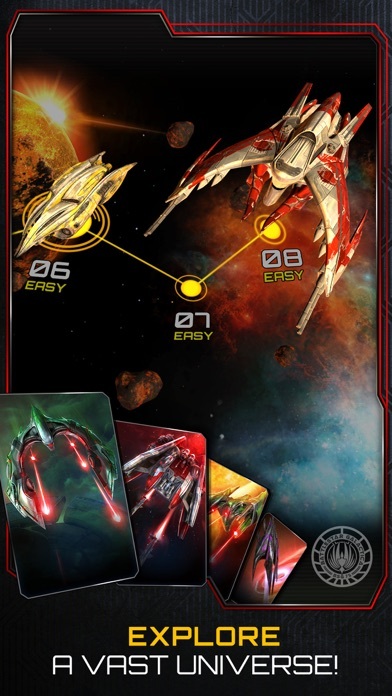 Battlestar Galactica: Squadrons™ currently does NOT support the following devices: - iPhone 4/4s - iPad Mini 1st Generation - iPad 2 - iPod Touch 5th Generation If you have comments you'd like to share, contact us here: https://ludia.helpshift.com/a/battlestar/ ©2016. Battlestar Galactica™ and Battlestar Galactica: Squadrons™ and their respective logos are trademarks and copyrights of Universal Television. Licensed by Universal Studios Licensing LLC. All Rights Reserved. saw this and it reminded me of Independence Day Resurgence: Battle Heroes. Looks very similar in how the battles are played out. Is one ripping off the other looking at the itune bios ID4 was updated on the 13th Sept and Battlestar was released on the 15th of course that doesn't count for any soft launch period. Still worth checking out BUT i do air some caution if you thinking of making any IAP Ludia main site is listed as "site under maintenance" and that rings alarm bells. I love Battlestar Galactica so Ill check it out but it makes me a little sad. Why someone doesn't make a great Shoot'em up I don't know. There's so much awesome material to do so. While the game looks great and has some interesting qualities, support is practically non-existent. And for a game that still seems to function like a beta (continual crashes, horribly matched PVP, loss of accounts), this is a glaring oversight. One would think Ludia would want to keep it's players around, but instead they simply don't respond to requests for help via email or on FB. It's like they're the out-dated, broken down cylon version. I was able to get one good reply from them about game mechanics, but when it came to problems with game performance or game access, my requests were completely ignored. Perhaps it's because they have no help to offer, which means yer pretty much on your own if you encounter problems. Keep that in mind, after you've spent a couple months grinding away, building up a decent fleet, only to be unable to log into your account one day. No help will be available, and your cries will fall on chrome domes, with that blank red eye just staring back at you. Perhaps their other games are more important, or maybe this is all part of the cylon trap. Whatever it is, you play at your own risk! 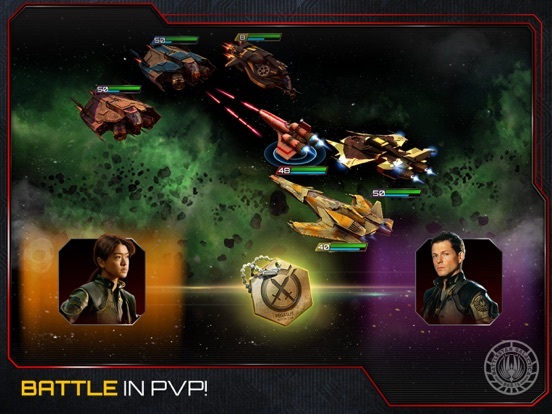 I'm a huge fan of boardgame battlestar galactica so definitely will check this out. Downloading right away!